Guests of the resort receive free access and it’s right across the street. The beach is just steps away – what more could you want? A free meal that you don’t have to make? Score! This resort offers direct access to Myrtle Beach. Kids will love the children's pool and lazy river on-property and they'll have a blast at Lost Mine Miniature Golf Course just across the street. Unwind with a relaxing float along the covered lazy river. Surprise the kids with a visit to the Children's Museum of South Carolina, a 15 min walk from the resort. Conveniently located in the heart of Myrtle Beach, Carolinian Beach Resort by Oceana Resorts is near many of the area’s best attractions. Once everyone is changed into swimsuits, and slathered head to toe in sunblock, head for the outdoor pool. Go for a relaxing swim or set up camp in a lounge chair with that book you’ve been meaning to finish. Children will have a blast at the kiddie pool and the covered lazy river provides a welcome break from the hot sun. Love the feeling of sand between your toes? The resort has direct access to the beach. Take a stroll – keep an eye out for seashells – or work on your sun-kissed look. Treat yourself to a massage, facial or body treatment at The Awakening Spa, located at sister resort Anderson Ocean Club. Carolinian Beach Resort offers one-, two- and three-bedroom condos that sleep four to twelve guests. All condos have full kitchens because sometimes a mini-fridge just doesn’t cut it. Head to Piggly Wiggly to stock up on groceries; it’s just one mile from the resort. Bring the kids along to help make sure no one’s favorite snack is forgotten. The resort has a free daily continental breakfast, so that’s one less meal to make. Flatscreen TVs have HBO so you don’t have to worry about missing the latest episode of Game of Thrones (or if the little ones have their way – Sesame Street). Feel like having a movie night? DVD players have you covered. Resort guests get unlimited free DVD rentals. Stop by the DVDNow kiosk to browse the selection of movies or bring your favorites from home. Pop some popcorn, gather the kids on the couch and get ready for a low-key night in. Take advantage of the in-suite washer/dryer to do a load of laundry while the movie is playing. 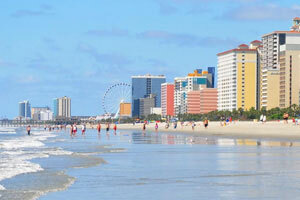 The Myrtle Beach Boardwalk and Broadway at the Beach are all just a short drive from the resort. The Boardwalk is home to one of Myrtle Beach’s best attractions, the SkyWheel. At almost 200 feet tall, the SkyWheel provides the best views of Myrtle Beach and is a fun adventure that everyone in the family can experience together. After your ride, grab lunch at one of the many restaurants on the Boardwalk such as the LandShark Bar & Grill, Original New York Pizza or Burger Paradise. During the summer, several events and festivals take place at the Boardwalk. Broadway at the Beach features a variety of dining and shopping. Hard Rock Cafe, Joe’s Crab Shack and Dave & Busters are just a few of the dining options. Surprise the little ones with a trip to Build-a-Bear where they can create their own stuffed animal. TV and Movie lovers will enjoy the memorabilia available at Hollywood Heroes & Villains. Bring your four-legged family member a souvenir from Reigning Cats and Dogs. As an additional bonus, resort guests receive free access to both Lost Mine Miniature Golf and Wild Water & Wheels Water Park (both open seasonally).